Harvest time at Goschie Farms. This is a ritual that plays out time and again in a state known for innovative hops with aromas and flavors the world has never experienced in beer before. These hops are the building blocks supporting the burgeoning local microbrewing industry. Farmers are seeing a spike in demand for hops, and entrepreneurs have found a niche growing specialty hops for avant-garde beers. “It’s exciting for hop growers to see the way craft brewers have really elevated this simple product,” Solberg says as he wanders the fields at Goschie Farms, one of the Willamette Valley’s largest hop growers and Indie Hops’ biggest supplier. It’s the second week of September, and the hops harvest is winding down for the year. Even though most of the plants are gone, Solberg still visits a couple of times a week, assessing the year’s take and visiting with Gayle Goschie, one of the first farmers to buy into Indie Hops’ vision of sharing Oregon’s “aroma” hops with the entire world. Goschie’s fresh face and warm smile belie the fact that she’s been working non-stop since the beginning of harvest four weeks ago. The Silverton farm, which Goschie runs with her brothers, is big enough that they harvest hops twenty-four hours a day between August 15 and September 15. Yet Goschie is wide-eyed and sharp when she meets with Solberg outside one of the farm’s hop barns. The two begin talking strict hop business, but before long they’re waxing philosophical about the future of the microbrewing industry. The demand for heavy, hoppy beers right now they compare to the big push for full-bodied cabernet wines a few years ago. Will it last or will preference for lighter beers reemerge? 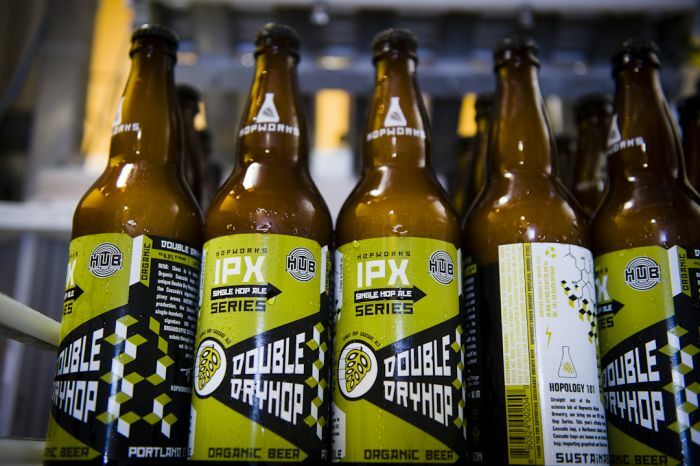 Oregon has been at the center of hop production almost as long as it’s been a state. The crop was first introduced in the 1850s, and by the late 1860s, it was being grown commercially, according the Oregon Historical Quarterly. In the early twentieth century, there were 1,500 growers in the Willamette Valley, and Oregon produced more hops than any other state in the country. The 1940s brought new machinery for processing hops, which helped advance the industry. When prices hit a low point in the 1950s, however, many farmers gave up on hops. 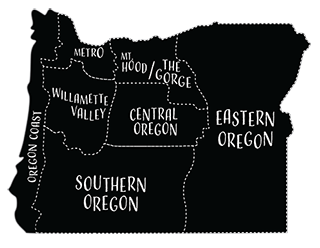 Today there are only a couple of dozen commercial farms remaining in the Willamette Valley—most of them between Independence and Hubbard. 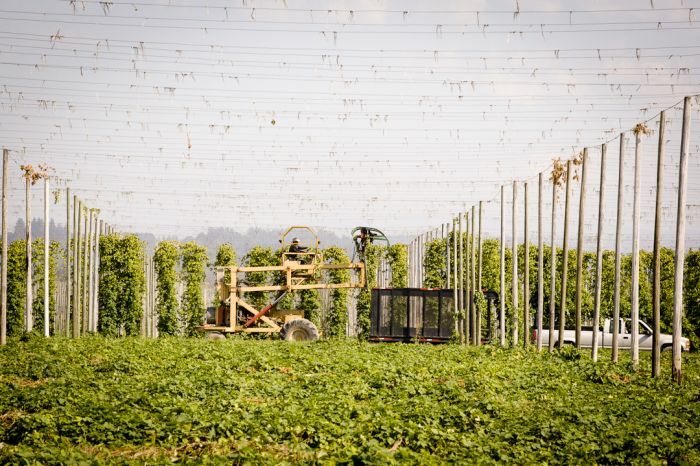 Together they’ll produce around 8 million pounds of hops on 4,200 acres this year, says Dr. Shaun Townsend, an assistant professor and senior researcher with Oregon State University’s Department of Crop and Soil Science. Hops fall into two major categories. There are bitter hops, which lend that signature bitter flavor to beer. There are also aroma hops, which provide scent as well as taste. Until twenty years ago, most Americans were used to beers made with bitter hops. If they wanted anything else, they had to look to European brews. Then the craft brewing industry discovered the Oregon aroma hop. Given this trend, the majority of the hops grown here are aroma hops—the type that’s putting Oregon back in the center of attention. Unlike continental varieties, which yield a flowery smell, Oregon hops have a distinct citrus odor. “It was a different aroma and taste that people hadn’t used up to that point,” Townsend says. “It was just interesting enough that people really jumped on it.” An industry was born. Nonetheless, the Northwest seems to have optimal soil and climate for nurturing the tall, gangly plants. In fact, nearly all the hops grown in the United States come from this region. 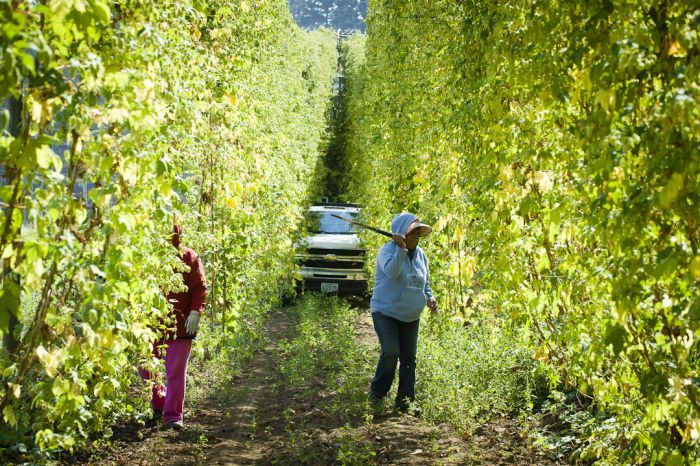 Goschie acknowledges that it has been an excellent growing season for Oregon hops. “This spring, when everyone was disgusted because it seemed like the rain would never stop, the hops were pretty happy,” she says. The late summer cooperated with warm days and offered no precipitation to slow the fall harvest. Hops are perennial plants that do best when they’re allowed to grow on trellises. Eighteen-foot posts that resemble skinny telephone poles rise out of the flat terrain at Goschie Farms. Every spring, farmers train an optimal three vines to grow up strings anchored to wires at the tops of the poles. Within five months, the vigorous vines are spreading from the strings to the wires, and before long are heavy with green cones. At harvest, workers use machetes to chop the plants near the ground. A towering machine comes along behind them and cuts the vines at the wire, allowing each one to drop into a trailer. The plants are then carted back to the processing house, where workers immediately hang them upside down from large hooks on a conveyor belt. A rake-like device pulls the leaves and cones from the vines, and the mixture tumbles over a series of conveyor belts, where gravity separates them. The next stop is the drying house, where the cones are spread on massive grates. Gaspowered kilns pump 135-degree air through the bed of hops until the moisture content is reduced to no more than 10 percent. Goschie digs her hops-stained yellow fingers into a layer of drying hops and pulls out a handful. Heat sends ripples through the air around her. “Inside each cone there’s a spine that runs down the center,” she explains. “Once a certain percentage of that spine feels dry, I know I’m getting to my target moisture content.” Mastering this touch comes from years of experience. So-called dry-hopped beers are also having their run. They are first dried with forced air to cool them, after which they’re piled in a warehouse to rest for a day. Finished cones are gently packed into 200-pound bales and wrapped in grey synthetic burlap for shipping. The whole process, from field, to bale, to cold storage, takes about forty-eight hours. Solberg was also ready for a change. He’d left his position at Nike years before and was just finishing another project. The two remembered seeing—and smelling—the hop fields near Corvallis and wondered if there were a way for them to break into that industry. Their timing couldn’t have been better. The brewing industry was facing a crisis in 2008. 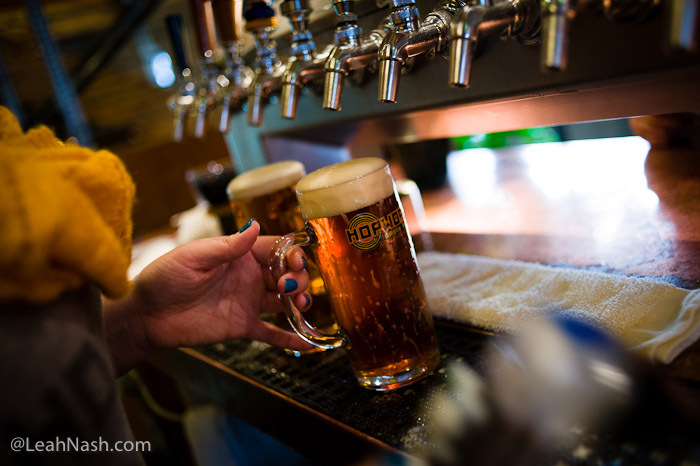 Supply of aroma hops couldn’t keep pace with demand and prices sky-rocketed. “Craft brewers were basically living off table scraps from the big guys” such as Anheuser-Busch, Solberg says. Without their own distributor to even out supply and negotiate the best prices, Solberg could see that brewers were struggling. “I thought, ‘A door might be open here,’” he says. He was right. 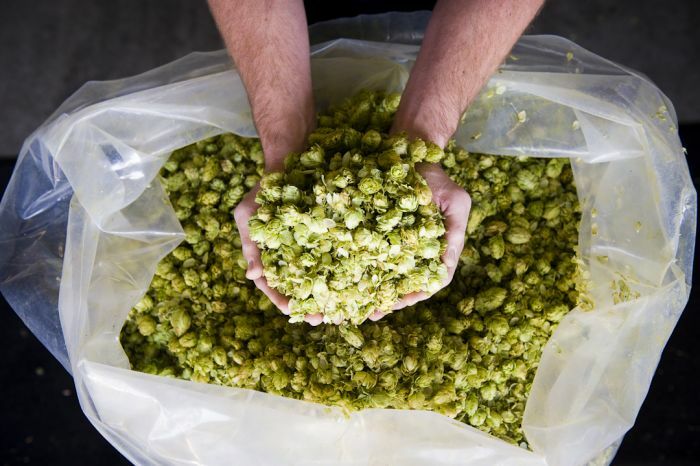 Indie Hops had 500,000 pounds of hops in their coolers in early September but was on track to have one million pounds by the end of the year. Following the industry trend, Indie Hops converts most of those whole hops into pellets. Using whole hops requires specialized equipment that most of the small- and medium- sized brewers don’t own. While pelletizing hops causes precious oils to evaporate, the pellets are less likely to clog machinery, and they retain a longer shelf life. It is difficult to discern the true aroma of pelletized hops, so Indie Hops ships whole hops, or so-called brewer’s cuts to its clients. 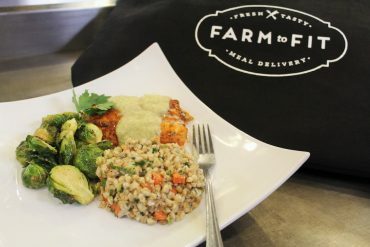 These brewer’s cuts give business owners a better sampling of what’s coming out of local farms. Until the brewer’s cuts arrive in his mailbox, Ettinger has plenty to keep him busy. On one particular afternoon, he’s digging into a bag of freshly dried Willamette hops from Twin Oaks Washington Farm on San Juan Island, a farm his in-laws own. He rips through duct tape with glee and pulls out a handful of dry, flaky cones. Then comes the rub-sniff—the golden measure of the hop. These hops will be combined with wheat grown on the same farm and used in a beer called ‘Pig War.’ The name comes from a border dispute between British and American troops that took place at a military base across from his in-laws’ property in 1859. “What I like about brewing is that it’s impossible to master and infinitely interesting,” Ettinger says. “It’s the perfect marriage of art and mad science.” He pulls out jars of malted barley to explain the ancient process of making beer and his inner mad scientist surfaces. As complex as some microbrews can taste these days, it boils down to four ingredients— water, barley, hops and yeast. The first step in making beer is adding water to barley to release its sugars. The resulting liquid, called wort, is twice as sweet as the typical can of soda. Hops are then added to counter that sweetness with bitterness, and this mixture is boiled in huge stainless steel kettles. Any other flavorings, such as herbs or spices, are added at this point. Once the beer is sanitized and the hot liquid has extracted flavor from the other ingredients, it’s transferred to a cooling tank and then a fermentation tank. Here the final ingredient, yeast, is added. 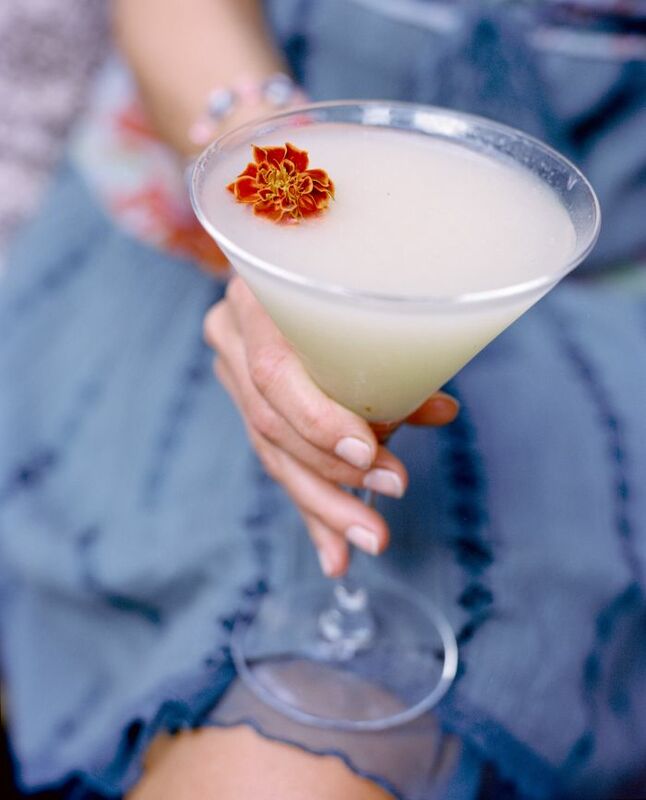 These naturally occurring bacteria have eight to fourteen days to convert the sugars into alcohol. After that, the beer is filtered, carbonated, and shipped. On a sunny and warm fall afternoon, Oakshire Brewery is flocked with craft beer aficionados who want to get the first taste of 100 Hops. Larry Price is among them. “It’s not a shy beer,” he says after the first sips. “Since you can only get fresh-hop beers once a year, there’s a real authenticity and immediacy to them. 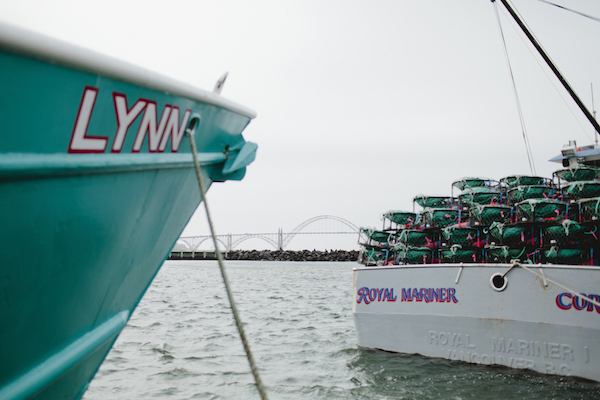 They’re a taste of Oregon, an immediate connection with nature. All photos by Leah Nash.